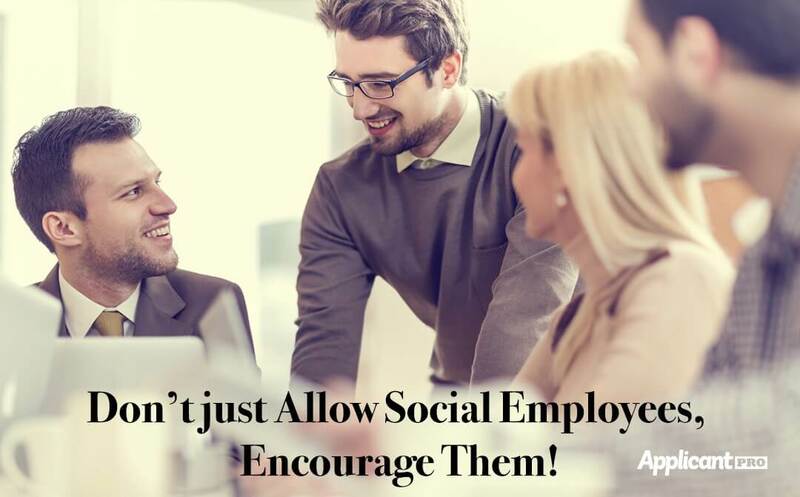 Don’t Just Allow Social Employees – Encourage Them! Should employees be allowed to use social media at work? Does this help or hinder the progress of the company? It seems like in many circles the overall consensus is that social employees = inefficient employees. Social media is often viewed as a time waster. An article posted in Forbes Magazine titled, “The Priceless Power of Socially Empowered Employees” makes the case that these employees can go further, farther for your company and brand if they are allowed, taught and encouraged to use social media sites like Facebook, Twitter, Instagram, Pinterest, and others. It can be very tricky to make a large sweeping change, especially when it involves culture, even when a positive and innovative change is being proposed. The biggest thing that needs to be done is to make sure employees are not left out of the discussion and that they feel like they are a driving force behind the change as well. In 2005, IBM decided they wanted to move into social business. Instead of issuing a mandate or policy on social media usage, they engaged their employees at the social level. They set up a platform that allowed the free exchange of ideas and asked for honest feedback in making the change. They found this practice to be invaluable and they saw better and more refined ideas emerge than had been discussed before. The other thing that happened was that they were creating a nearly immediate buy-in from their employees because they had a voice, they were involved and they were contributing. Once a change is made this way, the employees find it much easier to accept the change and follow the then defined policy. When talking to employees about using their social media to “promote” the company, it can be a tough conversation. You want their interactions to be impromptu, sincere and positive. In order to get the buy-in they were looking for, Adobe had stakeholders trained to get the right message out in the right way. They talked to employees about how social media would benefit them and the place they work. Cheryl Burgess, Author of the book The Social Employee, describes it as a Hub-and-Spoke type model. She says, “centralized resources, tools, and policies to ensure that internal and external branding efforts were congruent and fully leveraged across the organization.” The goal is to encourage participation within the bounds set by your organization. You’ve heard the saying that a little can go a long way. The positive and happy moments can go the longest way. Good things said about your company can influence an employee’s circle in a positive and sincere way. I have a friend on Facebook that shares pictures of company parties, mustache growing contests, awards won and other things as part of his updates. Because of his subtle, positive, and consistent sharing about his organization, I have looked into his organization and what they do. The positive sharing of one employee has swayed my opinion for the better. He isn’t an executive. He isn’t required. But he is getting a positive word out for free in a very sincere and marketing-free way. Positive customer experiences are a great way to get the word out on social media. Talking about how a customer was helped or even how an employee went above and beyond are other great ways to spread the word. What type of value could free, positive, and sincere social media exposure help your brand and organization grow? How do you support your employees in other positive, productive endeavors? Does a social workforce deserve support and encouragement? What “rules” would you need to put into place to make you feel comfortable in having a social employee group? Which players need to be involved within your organization to have management and employee buy-in? What could you do to get the conversation going in your organization?